This is a continuation of my adventures into moving to Visual Studio from the Powershell ISE you can find Part 1 and Part 2 here, they contain concepts we are building upon in here so are worth a read. 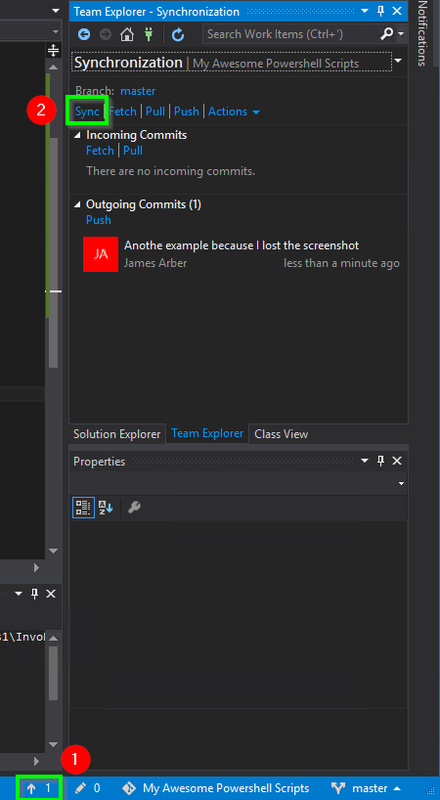 Anyway, last time we actually put some (very basic) code into Visual Studio and got it to run, we also created our Visual Studio Team Services workspace and Repo. Now we are going to start building upon that and implement the Git workflow. Part 4 will be how we manage different versions of our code and Hopefully In part 5 we will actually get to writing and debugging PowerShell in Visual Studio using features like intelisense and breakpoints. 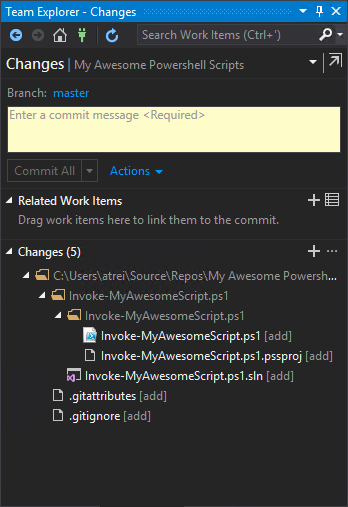 If I lose you at any point here, go and read the honestly fantastic guide on the Visual Studio Site https://www.visualstudio.com/en-us/docs/git/tutorial/gitworkflow because its really really well written. Version Control, Git and a Push me Pull you. So, what is Git? 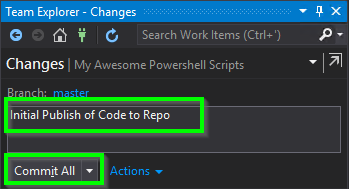 Git is a version control system, last time we just saved our code locally and run it, now we need to to Push (Upload) our newly written code up to the Repo (Visual Studio Team Services) to we can track changes, colab with others, and allow others to download the code. It’s important to remember that there are actually at least Two Git repo’s with your code in them. One on your machine and one on Github/Visual Studio Team Services. When you edit and commit the code, you are doing this to your Local repo. You then Push your Commits (Changes) to the Online Repo. But before you can Push your client will also Pull any new changes from the Online repo to your Local repo. 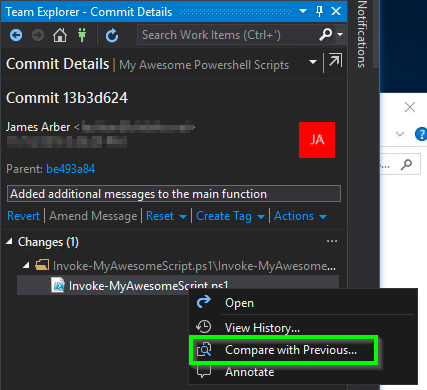 If someone else updates the same bit of code you are working on Git will help you decide what bits of code win, then let you Push your content with the amended changes. Remember the Git controls I mentioned earlier? No? 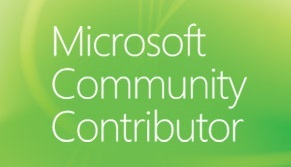 They are in the bottom right corner of the Visual Studio ISE. Let me explain the icons in a little more detail. This is the current Git Repo and is the repository for all your stuff. It can contain 1 solution (script) or many, its entirely up to you. If you are going to need separate Branch management (for larger projects) you are going to want your own repo per project. This is the Current Branch and is a fundamental concept of Git. For now we are going to stick with the Master branch to keep complications down. This is the Uncommitted Change Counter: These are the files/resources that have changed in your local workspace that haven’t been Committed to your local git repo. For example, if you have edited a file and havent Commited it yet, you havent told Git what the change was about. Thus it hasn’t tracked the change! This is the Publish Counter: These are Commits that have been written to your local repo, but not Pushed (Published/Uploaded) to the Online repo. 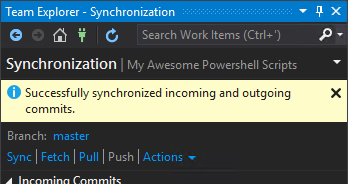 Clicking this brings up the Sync tab in Team Explorer. You Sync the changes once you are ready for them to be shared with your team/stored online. Typically after a successful test (Especially in the Master branch!) 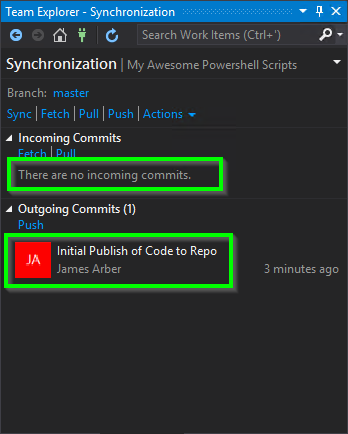 as the idea is anyone else with access to the Git repo can Clone the repo and work with the code. Okay, enough theory, Lets actually do it. As you can see I have 5 uncommitted changes from creating our project from before. As this is the first time I’m publishing and we don’t have stable code yet, its fine to publish into the Master branch. So we click on the Uncommitted Change Counter to Commit our changes. This is also our chance to add any other files that are needed by the script in the Repo (For example a template file) by just dragging them into the “Related Work Items” section. There is no need to list the exact changes you made line by line (Git does this for you) but it needs to make sense when you review it later when working with branches. Remember that you might have to read these messages in 10 years’ time. So it makes sense to explain well. Once again the Team Explorer window will update with information. Great. So now what happens when I make changes? Lets change some of the code. Notice the Green bar changed to Yellow to indicate we changed the Lines? Note that the change counter has gone up to 1? That’s because we only changed 1 file. Don’t think though that Git can only manage whole files, theres alot more smarts to come. Lets go ahead and commit that. Notice the Publish Counter increased? That’s because there is a Commit waiting to be Pushed. Let’s quickly review the Commit before publishing it to show some of the version management. You should be presented with details of the Commit itself. You can see here that Visual Studio gives a very powerful, very graphical representation of the differences between files. Not only is the background of the text red or green depending on if the content was added or removed, but the scroll bar shows this as well. Handy for larger scripts. If your happy with the changes, you can then Push them into the Online repo. Next time I’ll get into Branches, Merge and Pull Requests and explain this all in more detail. I hope you find these guides helpful as they are alot of work. Leave a comment below with any ideas, suggestions or feedback.